You can lie, but your fingerprints never will. At my department we have the greatest piece of technology to combat LLPOF. That’s short for “Liar, Liar, Pants on Fire.” We use the Bluecheck fingerprint device whenever someone doesn’t have identification. It’s a game changer when it comes to trying to identify someone. The look on the suspect’s face is priceless when we tell them what their real name is. This device is easy to use and works wonders. The device communicates with my work laptop computer and the internet. 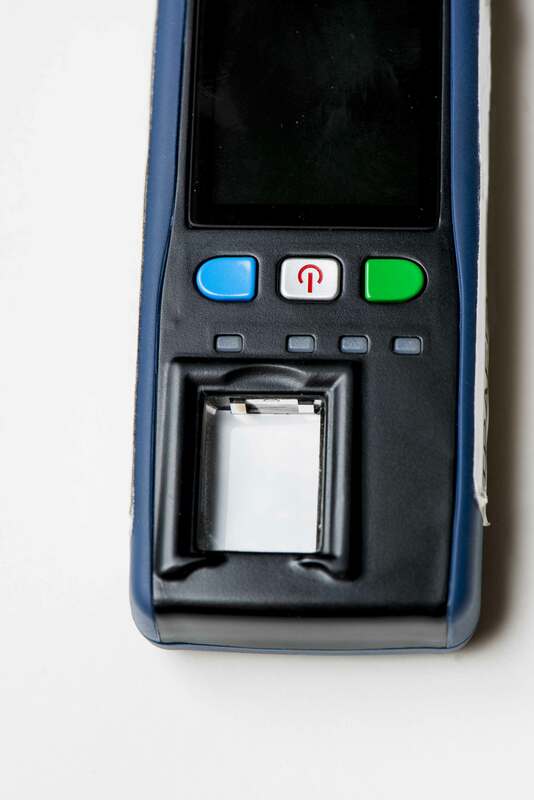 Both of the person’s index fingers are placed on the device and it captures the prints. The prints are then sent to the computer via Bluetooth. A search is then done through our police department records, the Department of Justice and the FBI. The results usually come back within a minute. If they have been arrested before then the prints will come back with a name. If the person had been booked at our department then their picture, name and birth date will appear on the screen. If their fingerprints are in the DOJ database then just their name and date of birth will appear. Finally the FBI might alert on the prints. He finally admitted to using his brother’s name and birth date because he had two warrants. He also had warrants in another state. I think this guy was feeling pretty confident with the information he had given before the Bluecheck was used. Another time I used the Bluecheck at a traffic accident scene was when one of the drivers was unlicensed. My gut feeling was the driver wasn’t telling me the truth about his name so I brought out my LLPOF detector. Before checking his prints, I asked him the same basic questions about his information and I asked if he had ever used a different name before. Of course, he said he was telling me the truth and he had given me his true name. Within a minute his picture appeared on my screen with a different name and birth date. The picture on my screen was from twelve years ago and he looked considerably younger. A little research showed he had been arrested twelve years earlier for driving while unlicensed. I’m sure he failed to appear on that charge, but it didn’t matter now because here we were over a decade later. I took my lap top over to the suspect and showed him his picture. The look of surprise on his face was awesome as he said, “That was a long time ago.” As he went to jail, the suspect said, “I’m telling the truth now.” Whatever. One of my favorite Bluecheck stories involved another traffic collision. There had been four people in the suspect vehicle that had crashed at 3AM. One of the people lied to us about being the driver and was arrested after witnesses came forward and pointed out who the real driver was. The real driver went to jail for DUI. That left two other passengers. They both gave false names and birth dates to the other officers. The Bluecheck revealed their real names and they both had warrants. Four occupants. Four arrests. Good thing they didn’t have a minivan full of people. And finally, I was sent to a car stop one night for the Bluecheck. The officer had already written the ticket for the driver, who was unlicensed, but he hadn’t signed it yet. There was a sergeant and another officer from a different department on the car stop with our officer. They had never seen the Bluecheck before and I explained to them what it did before I captured the prints of the suspect. Within five minutes the suspect was in custody for lying about his name. He also had a DUI warrant for his arrest. There are times when the person is telling the truth and the Bluecheck confirms their information. Other times there is no record of the person’s prints because they had never been arrested before. This device is pretty cool to see in action and it always amazes people when they see it used. Every department should invest in this technology.